Is your loved one finding it so difficult to communicate that they’re withdrawing from the world? It can be heartbreaking to witness the loneliness that comes with dementia, especially if you believe nothing can be done. The truth is that there are a variety of effective ways to cut through the isolation. One newer method you may not have heard about is dance therapy. A growing number of people are discovering how moving to music offers those at all stages of dementia a fun way to interact with others and build relationships. The most important benefit of dance therapy is that participants get to “feel more connected to themselves and to their own bodies, their memories, their thoughts, and to other people,” she says, adding that everyone comes out of a dance therapy session feeling livelier. On days when she’s slow to greet everyone, Newman-Bluestein often asks participants if they feared she would forget them. “Without fail, they all say yes,” says Newman-Bluestein, who says she believes dance therapy provides “an antidote” to any feelings of abandonment or powerlessness participants may be experiencing. On top of that, dance therapy helps energize people. Some participants can't remember their own name, but “when you turn on Ella Fitzgerald’s ‘A Tisket, A Tasket,’ they're singing right along, and they remember all the words and they're smiling as they're singing,” she says. Although some research suggests that social dancing may benefit people with cognitive impairment, dance therapy (which is a form of psychotherapy) is nothing like a dance class. “We're not teaching them movement, we're using the movement they have,” says Newman-Bluestein, who co-wrote a manual to help dance therapists and caregivers communicate nonverbally with people with dementia. So, what does a dance therapy group look like (and where can you find one)? At the beginning of each session, participants gather in a circle. “In that way everyone can see each other, and everyone feels validated and I'm kind of equal,” says Goldstein-Levitas. The therapist gets things rolling by playing lively music that encourages participants to move their fingers or toes or other parts of the body. Most of the moves are done in a chair, since many participants use mobility aids. Then, to encourage more movement, the facilitator might name the ways different participants are moving. For instance, Goldstein-Levitas describes how she may comment how Miss J is starting to tap her toes or how Miss S starts shaking her shoulders. People with dementia also tend to get distracted easily, so when she wants to redirect participants, Goldstein-Levitas often talks about food, which she says is typically a “huge hit.” In one group, a conversation about grilled hot dogs and hamburgers stirred up memories of childhood family barbecues. In another, talking about ice cream led to some participants reminiscing about—and then acting out—their mothers churning ice cream. “The movement kind of becomes symbolic of whatever we're talking about,” she says. 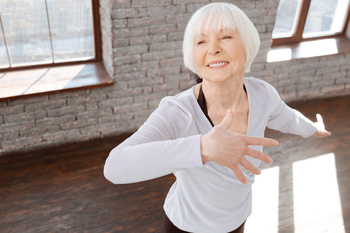 As well, dance therapy can help alleviate the agitation or aggression often seen in those with late-stage dementia. Newman-Bluestein gives participants balloons or blow-up baseball bats to help them safely release aggressive feelings.